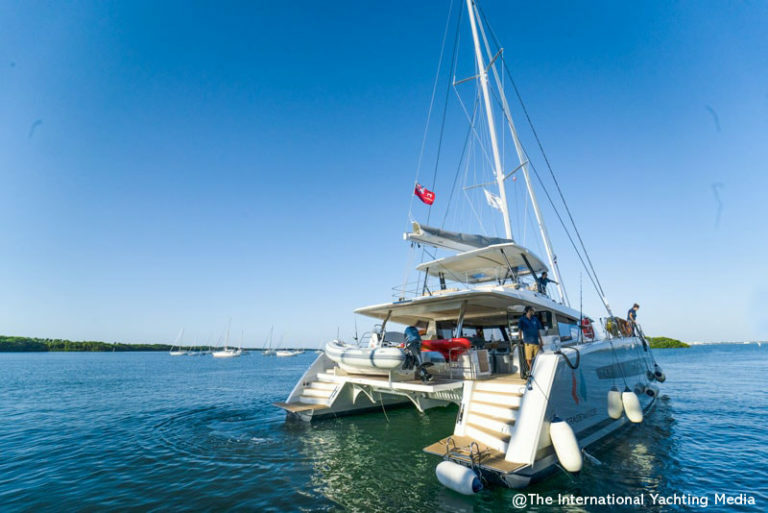 Finding oneself fantasizing about leaving for long comfortable luxury cruises around the world on a catamaran is a thought common to many of us. 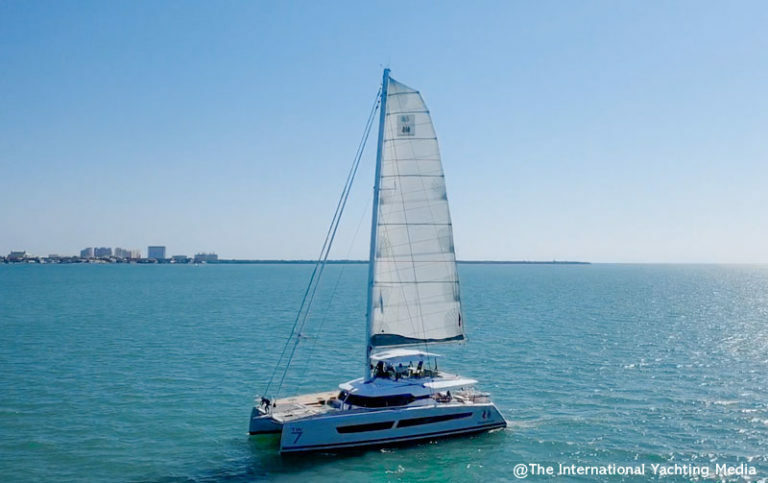 This type of boat has undeniable qualities that make it the best option to achieve our dream that, almost always, takes for granted that cruising sail-powered catamarans pay the price of the comfort they offer with sailing performances that cannot be considered as “inebriating”. 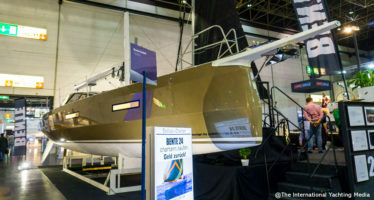 That’s at least what we thought until we got our hands on the wheels of the new Fountain Pajot Alegria 67 that, in a wholly unexpected way, terribly surprised us both in terms of sailing performances and ability to sail close to the wind. The day chosen for our sea trial is perfect. 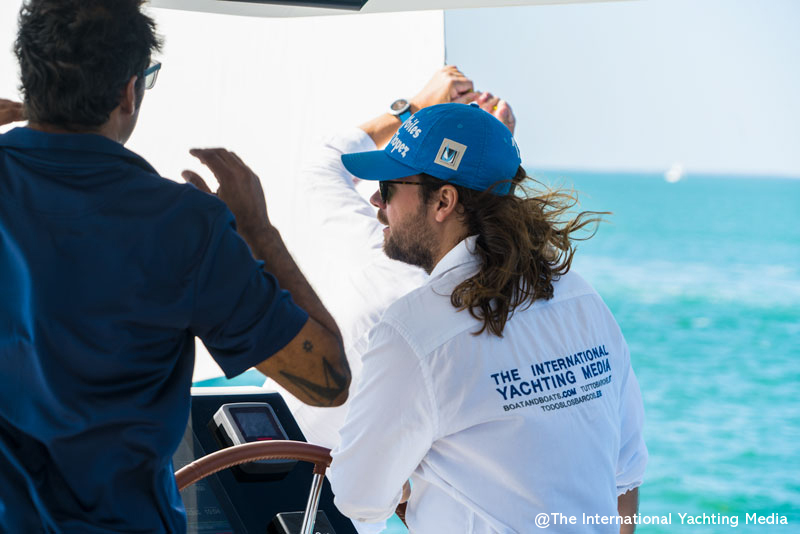 The sun shines high in the sky, the sea is slightly rippled and the 10-knot breeze that channels between Miami and Key Biscayne is fresh. These conditions are perfect to test a sailing catamarans since it’s exactly within this wind range that we can appreciate its qualities. 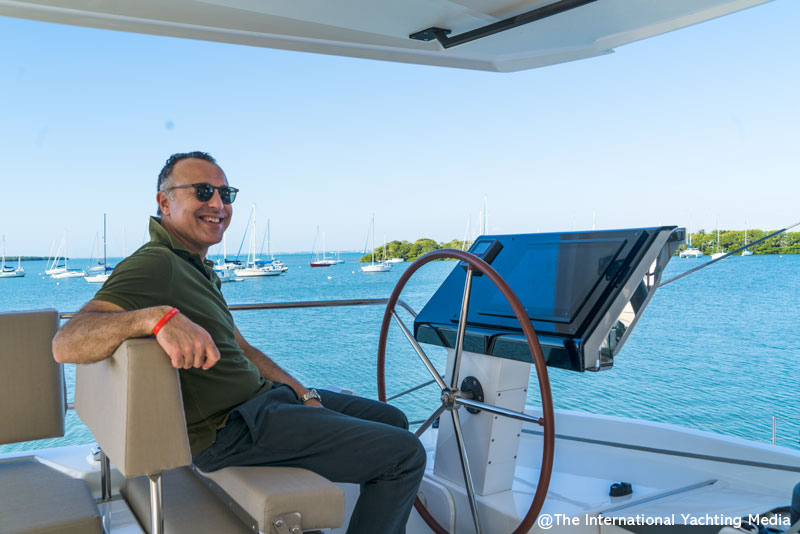 I climb on board and, before casting off, I make a full inspection of the catamaran, accompanied by Domenico Furci who, nice and helpful, will assist us during the test. 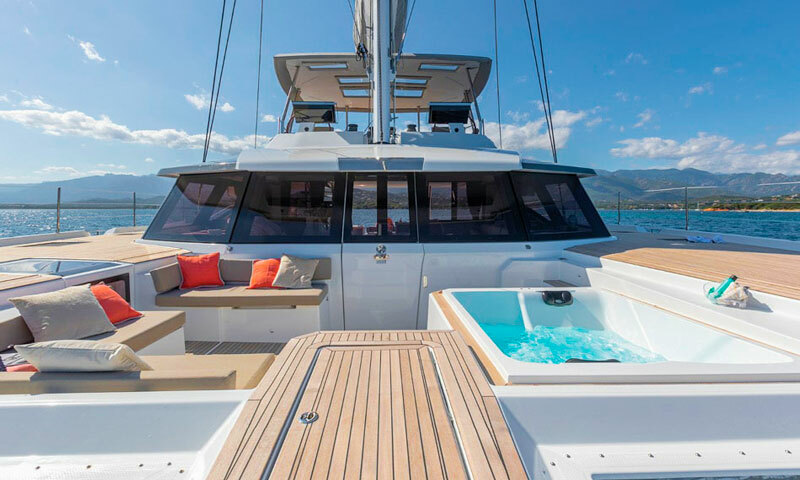 When visiting a 67-foot catamaran it is normal to expect large, spacious and functional spaces but here, on board the Fountaine Pajot Alegria 67, reality really exceeds imagination. When I get the bow, I even have to rub my eyes to believe what I see: a jacuzzi, perfect to accommodate two people, is integrated into the cockpit. I had never seen one on a sailboat of this size, not even on a catamaran. 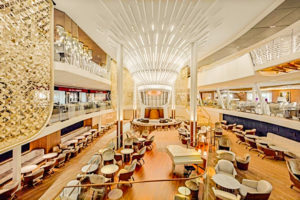 I wonder whether all the amenities and gadgets I’m discovering in every corner of the deck, all destined to make the stay on board more pleasant, can adversely affect performances with their weight. The main fuel of the catamaran is wind and we are really at full load. 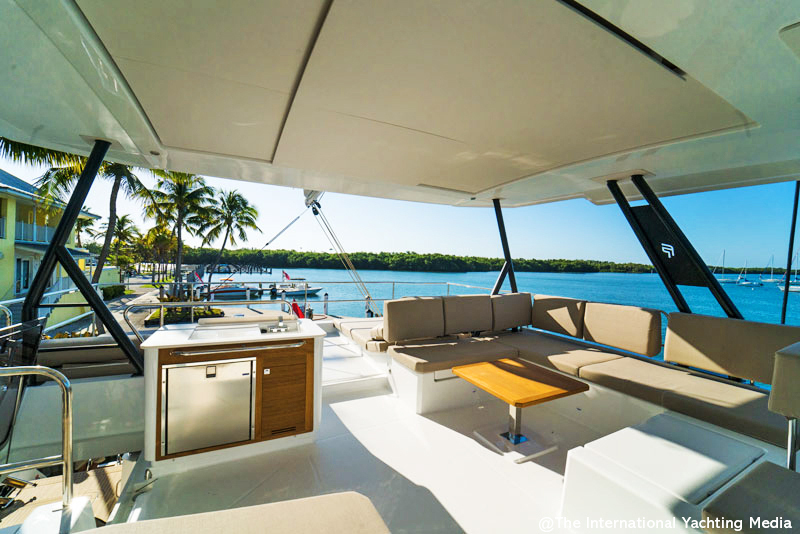 The Fountaine Pajot Alegria 67 is just back from the boat show and is therefore loaded with all the material necessary for the exhibition along with what the owner needs for the long cruise he will take right after our test. But, as I told you before, I will be obliged to swing around soon. We cast off and I climb on the flybridge. 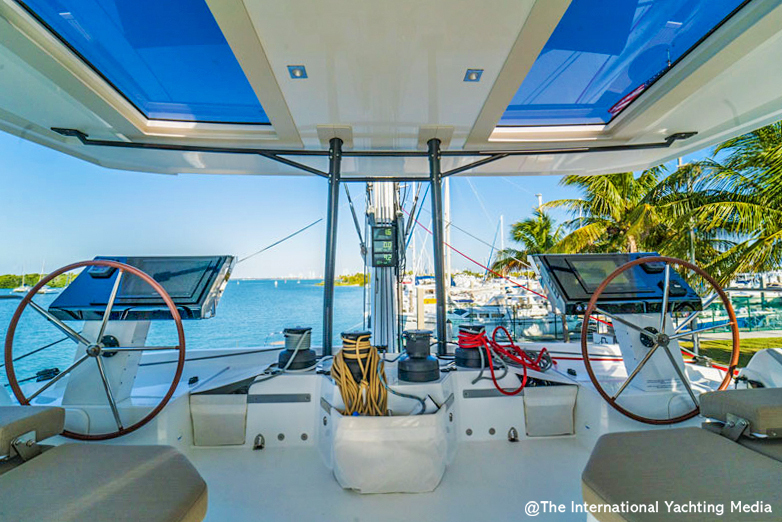 From here, you can steer the boat easily, all rigging is led between the twin helms, easily accessible from both the port and the starboard side. Rigging is also supported by four electric winches, all grouped and positioned close to gears. We put out to sea and head for the centre of the bay where the wind seems to be more stable. While we approach and before hoisting sails, I take the opportunity to detect power performances. 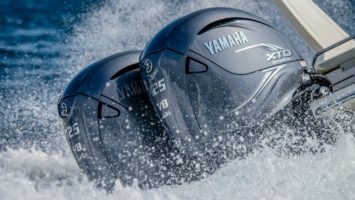 The economical cruising speed is 7.6 knots at 1,800 rpm while the fast one is 9.5 knots at 2,400 rpm. These figures are really interesting, especially if we consider the load we are carrying. 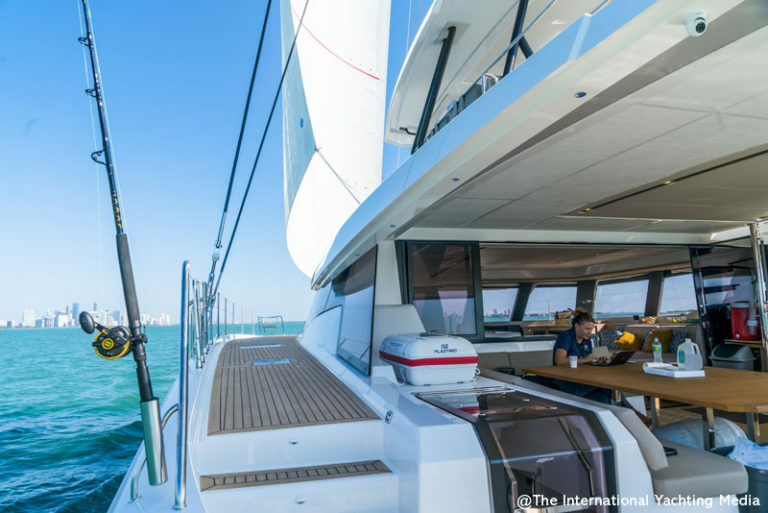 Just the time to open the lazy bag installed on the V-boom – a simple operation that you can perform by climbing on the hard top – and we haul the mainsail with the help of the winch. I push the electric furler button, positioned next to the steering console, and unroll the genoa. 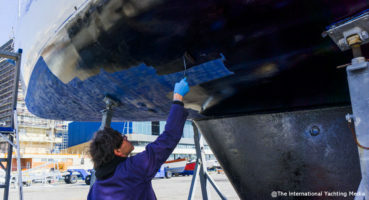 We have no difficulty in unfurling the sails, which is another indisputable sign of how the Alegria 67 allows for very easy steering based on the easy sailing principle. Now, it’s time for us to stop the engine and test the various points of sail. I start with the most congenial one for a multihull: close reach. I maintain a 50-degree angle to the apparent wind and, in a flash, the Alegria 67 accelerates and reaches a speed of 8.7 knots. A great performance, with a true wind blowing at about 10 knots! 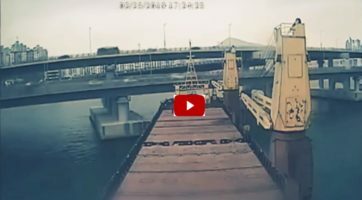 The wheel is direct and sensitive, I didn’t expect that on a boat of this size. Steering the boat at this point of sail is definitively funny and easy. I luff gradually and start to haul sails aft. I find out that it’s an operation I can perform myself thanks to the special configuration of equipment and the help of electrical devices. 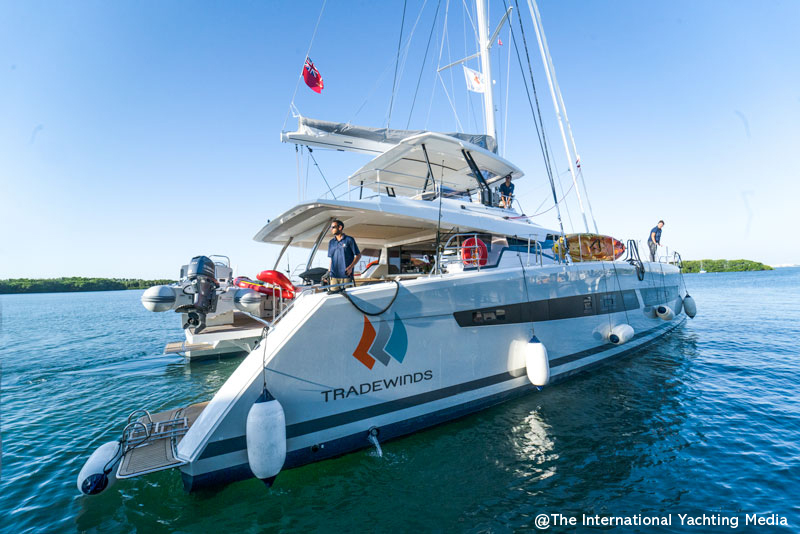 The mainsail sheet has an electric winch while the traveler is adjusted by an electrically-operated sliding system supplied by Antal. I sail close to the wind and push the apparent wind towards points of sail that are less congenial to multihulls. 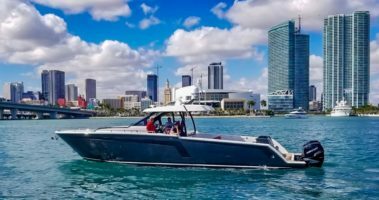 At 45 degrees, I lose only half a knot of speed and that’s at this moment that I start to realize that the Alegria 67 is not only a comfortable boat but sails very well, too. 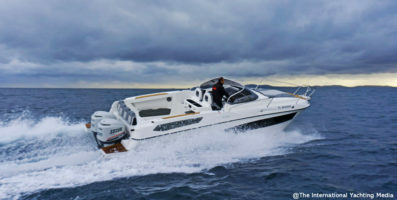 I decide to go beyond and, at 40 degrees, the catamaran surprises me again with a speed of 7.3 knots. I exaggerate and hug the wind more and more. The Fountain Pajot 67 astonishes me since she sails close to the wind at 35 degrees, with a speed of over 6 knots and a true wind of just 10 knots! We try to tack and we have to roll the jib to do that. 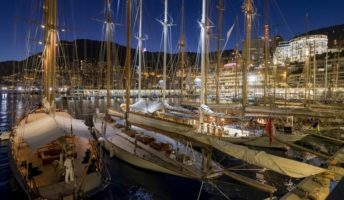 The foresail stay has been already fitted out in order to make the boat prepared to any contingency during the next cruise. No harm done, I push the furler button, release the sheet and, within a few seconds, the jib disappears. I sail close to the wind, the mainsail tacks and, finally, I re-open the jib. 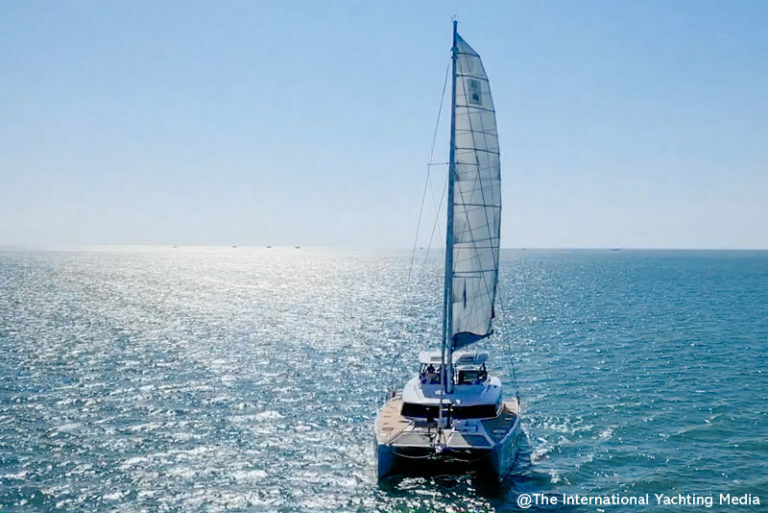 For a few seconds, I keep an angle between 50 and 45 degrees, just the time to create more apparent wind and the boat sails fast, which is another uncommon characteristic for a catamaran of this size. I bear away until 80 degrees of apparent wind. At this point of sail, running on the quarter and with only the genoa, I record a speed of 6.7 knots. 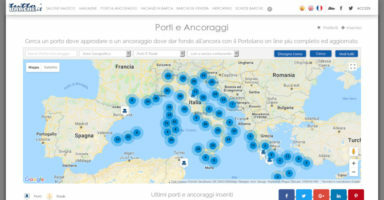 Satisfied with the performance, I turn the autopilot on and enjoy navigation. I leave the wheel with a smile; this Fountain Pajot Alegria 67 has completely won my heart. She is fast, easy-to-steer and reactive, a genuine ” cruising machine” that is as beautiful as able to really sail. 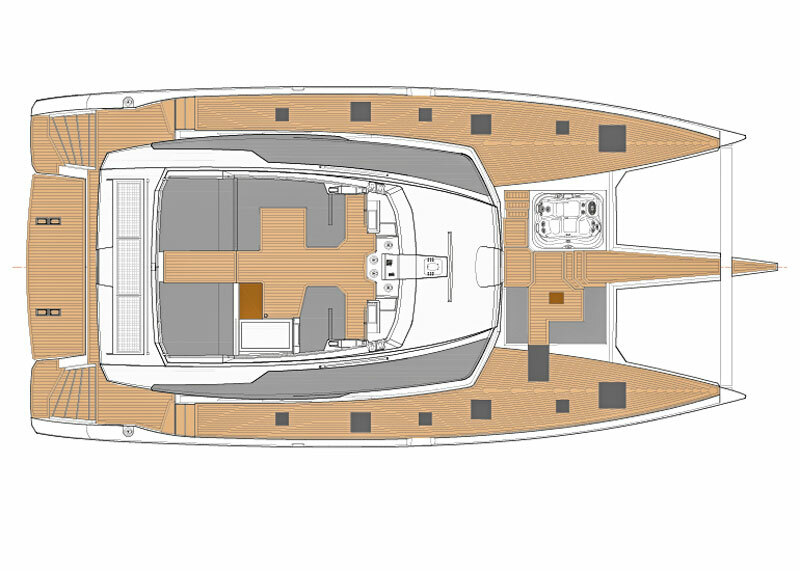 The studio Berret – Racoupeau has not only designed a fast spacious yacht. 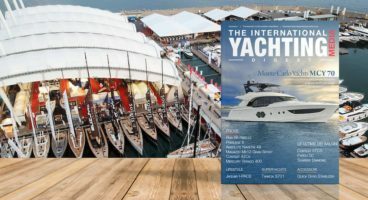 The Alegria 67 is a boat where excellent performances match an exquisite interior architecture that is able to engineer every single square centimeter of the huge spaces available. 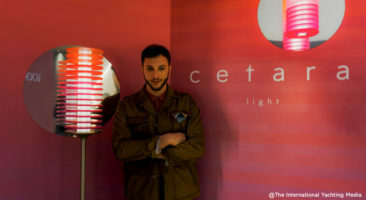 The result is a project that, thanks to the implementation of intriguing innovations, perfectly reconciles the large areas on board with the privacy need of the owner and his guests. 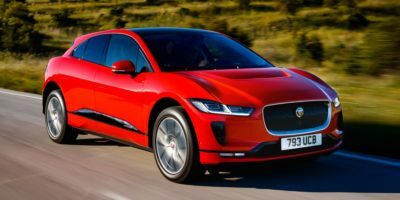 The beautiful forward area is a clear example of this concept. Here, a jacuzzi and a cozy dinette are positioned below the deck level. 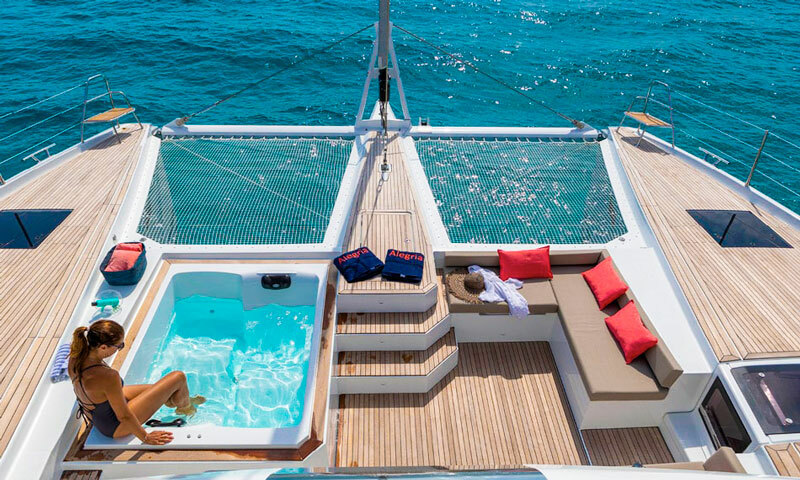 The result is a space that, whilst it doesn’t sacrifice the forward view when sailing, gives moments of precious privacy both in port and at anchor. 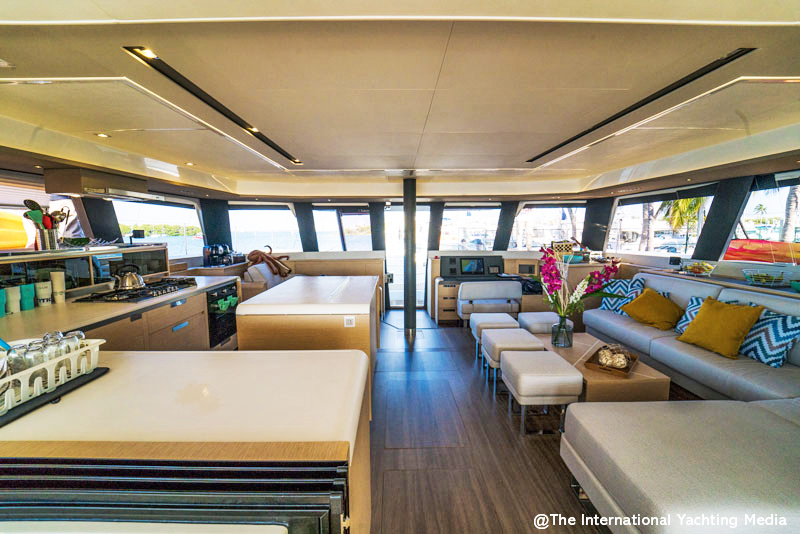 The aft cockpit and the dinette, separated only by a long glass sliding door, compose a unique huge loft overlooking the sea. A rectangular table, positioned on the left of the cockpit, can seat 12/14 people and communicates directly with the galley on the same side. 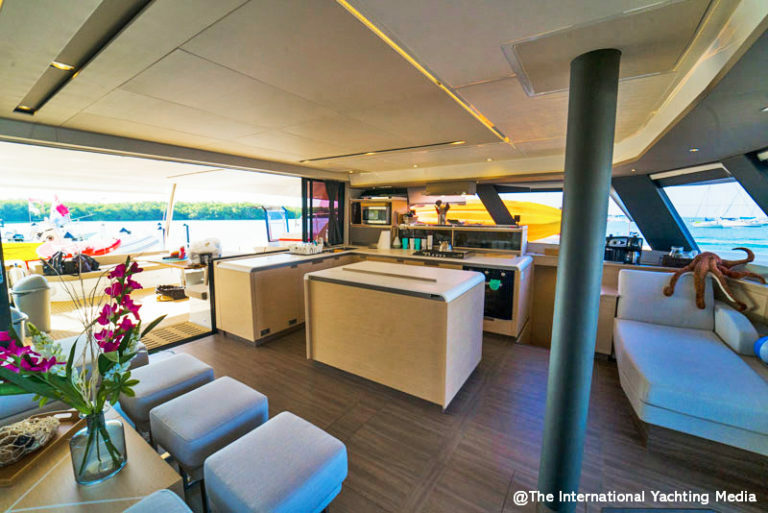 This central position allows to serve both exterior and interior areas with a solution that, in addition to being blatantly beautiful, is functionally perfect because it is placed at the very centre of the convivial life aboard. Those who wish to grill in the open can enjoy a big plancha grill equipped with BBQ, sink and refrigerator, placed aft and perfect to let smoke and smells out when cooking at the anchor. 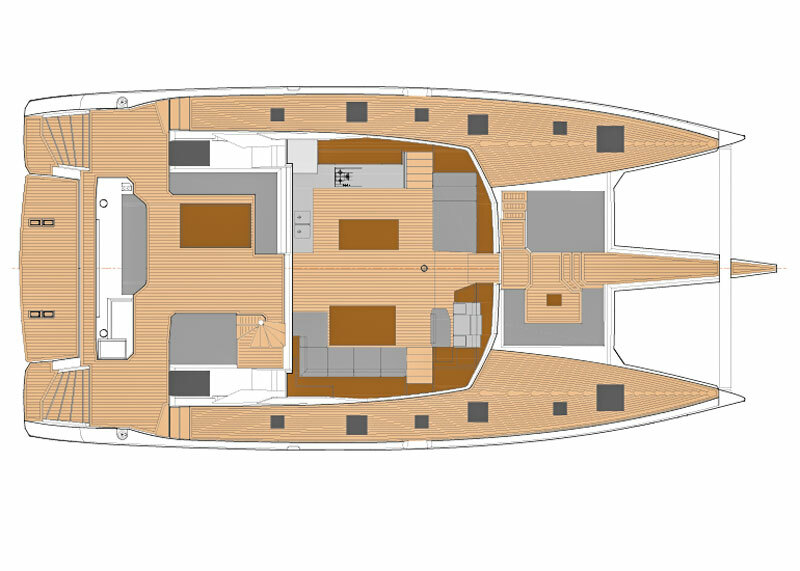 To give priority to the owner, although the Alegraia 67 has 5 guest cabins and 2 crew ones, is certainly a key point of the project. 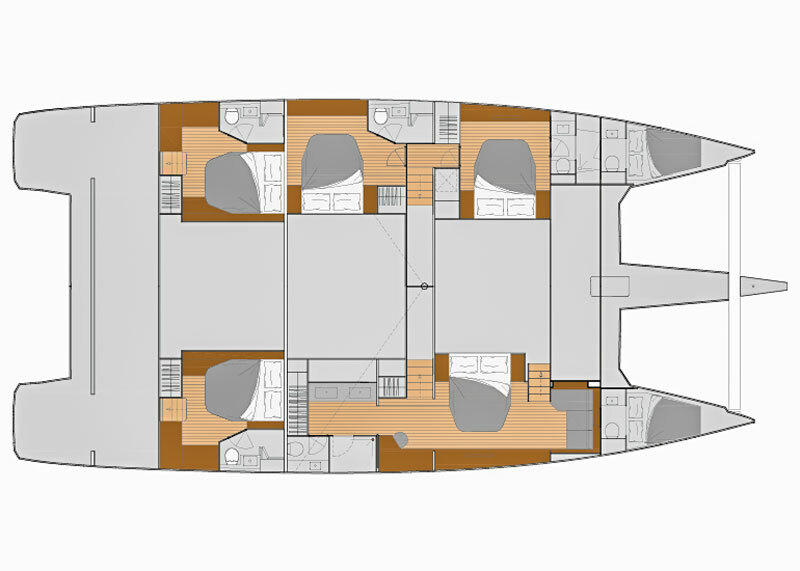 In the version we have tested, the master cabin and its huge bathroom take up the whole central section of the starboard hull. 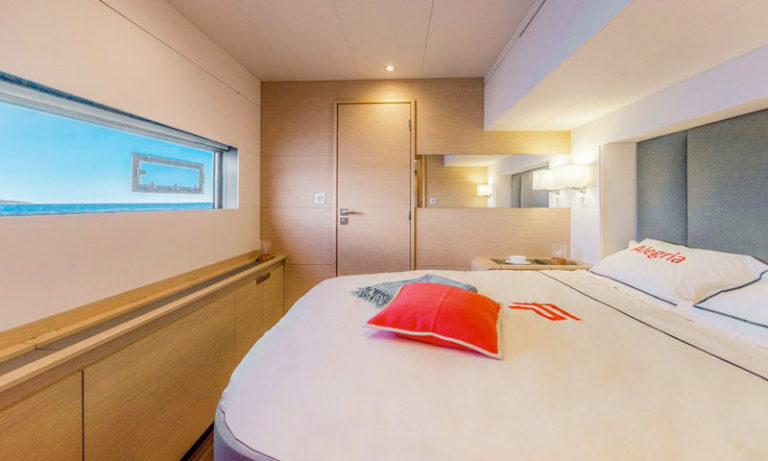 Just to give you a term of reference, suffice to say that the same section on the port hull accommodates two double cabins, both of excellent dimensions and equipped with en-suite bathroom. Moreover, the master cabin has two entries. The first is from the dinette while the second gives instant access to the forward lounge and the jacuzzi. Once again, this configuration confirms the exceptional nature of the work carried out by Berret – Racoupeau architects. In the cabin, we find a comfortable sofa on the left and a large double bed placed diagonally on the right. Moving aft, we enter, or better, we find ourselves in the bathroom whose first part, equipped with a vanity top with double washbasin, is indeed an open space. This area has surprising dimensions and is equipped with a walk-in closet and two compartments that, closed and separate from each other, act as shower box and toilet respectively. 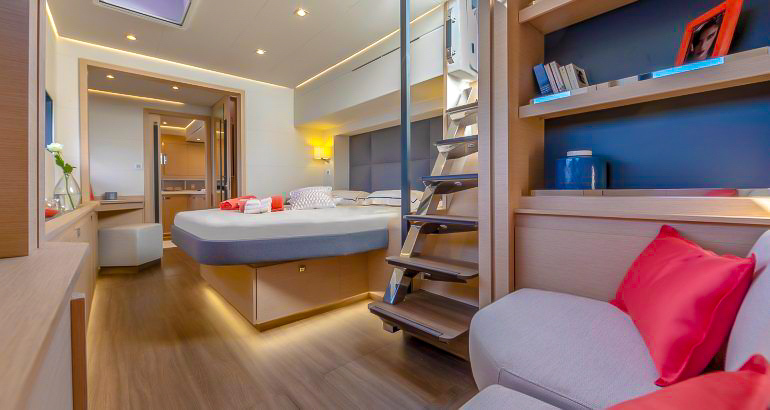 The aft section of the two hulls, instead, accommodate two VIP cabins that, equipped with a queen-sized bed and en-suite bathroom, benefit from exceptional privacy because each of them has an independent access outside. 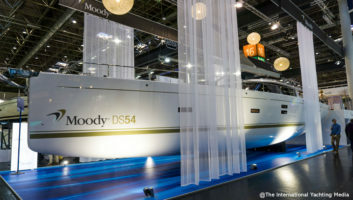 Particularly noteworthy is the tender platform that, cleverly positioned on the transom, can be raised or immeresed into the water thanks to a special hydraulically-operated mechanism. Convenient to launch the tender, this solution also gives more functionality and fun to the sunbathing platform that becomes a real beach area when opened over the water. At the end of our tour, we finally seat and take stock of our visit. 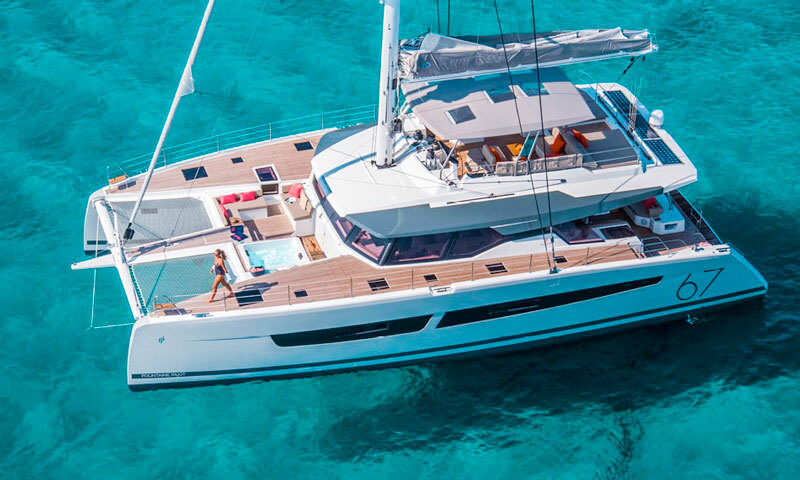 This Fountaine Pajot Alegria 67 is a really extraordinary catamaran. Fast under sail and meticulously designed to fully enjoy the sea, she can only be considered as practically perfect. She is going on cruise without us!